As a busy mum I often forget about looking after myself, including my feet! As most mums will know we spend a lot of time on our feet running after our little ones, tidying up, school runs etc yet we seem to neglect our feet and the care they deserve. So slipping off to the beautician or spa alone for a peaceful pedicure may be a thing of the past since having kids but Scholl have brought out the next best thing, the Scholl Express Pedi! The Scholl Express Pedi is a hand held electronic foot file which with the help of the diamond crystal roller head leaves feet feeling smoother and softer. 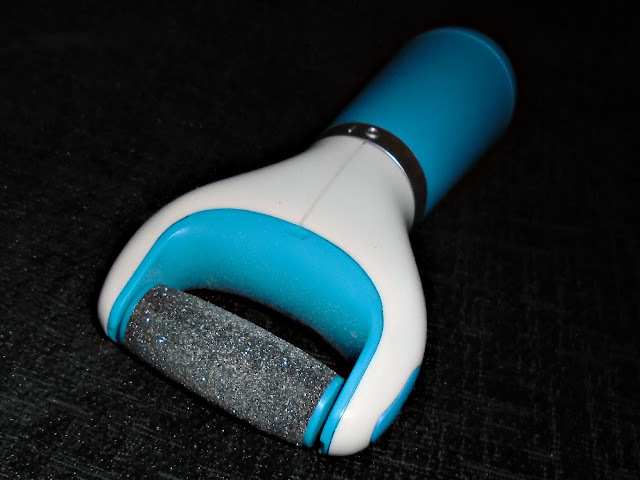 The battery operated device spins the specially designed Micralumina roller with diamond crystals at high speed to gently buff and exfoliate away rough and hard skin. I have to be honest since the sun has disappeared and Autumn/Winter have been making there apperance my UGG boots have made an apperance and I have neglected my foot care routine all together. So when the Express Pedi arrived I was really excited to give it a go. The Scholl Express Pedi is easy to use, you simply ensure the roller head is firmly attached then twist the silver ring around the top to the left which will start the roller head. Now you simply glide the roller head over the dry/ hard skin area's on your feet to exfoliate away the dead and hard skin. Making sure you don't press to hard as this will make the device stop, you also need to make sure you don't hold the device in one area for more than 3 - 4 seconds as this could cause some discomfort. When you are happy with the results and your feet are restored to a softness you are happy with just twist the silver ring to the right on the device which will switch it off. You then need to rinse of your feet to remove and excess skin that may still be on your feet, you should also treat your feet to a really good moisturiser after doing this to ensure they stay smooth and soft! Over all I was really impressed with the Scholl Express Pedi, it was easy to use and really does work although it did take some persistence on the worse areas! The ergonomically shaped soft touch handle makes it easy to hold whilst in use and easy to maneuver around the foot. The Scholl Express Pedi is priced at £39.99 which I did initially think was a little steep but since trying it out I think it is most definitely a worth while investment as means you can keep on top of dry skin regularly at home. I can now be certain I have beach ready soft feet ALL year round! Have you ever tried the Scholl Express Pedi?